It's recess time at Ruby Bridges Elementary School and a third-grader is pummeling a plastic tetherball with focused intensity. He's playing at one of more than a half-dozen recess play stations on the school's sprawling cement playground — there's also wall ball, basketball, capture the flag, sharks and minnows, a jungle gym and tag. The kids at this school in Alameda, Calif., a city on a small island near Oakland, get recess-time help from coach Kenny Wong. Wong is an employee with Playworks, a nonprofit that works with low-income area schools in California and across the country. time with help from the nonprofit group Playworks. A growing body of research shows that play is fundamental to kids' development by promoting social interaction, exploration and creativity. There are no recent national studies or fresh numbers on recess time, but 2005 data from the Education Department survey and a 2006 report from the Centers for Disease Control and Prevention show that about 9 in 10 elementary schools regularly schedule recess, with times ranging from 24 to 30 minutes a day. Still, many districts report that they are under continued pressure to add instructional time to the day — and recess minutes are often the first place administrators look. But some schools, many with help from Playworks, are pushing back against those cuts. At Ruby Bridges, Wong is organizing a freewheeling, high-energy game of tag called "everyone's it." It's fun, but it's also a way to get kids moving without making them run laps. "There's a lot of running involved," Wong explains. "During stretches or running laps, kids will just hate running laps. But once the game starts, they'll just go nonstop." California mandates 400 minutes of recess a month, but Ruby Bridges has embraced expanded recess. Principal Jan Goodman says it's an important tool to help promote a healthy lifestyle and help kids stay focused in class. School districts that are cutting back on recess or physical education to save money or add instruction time should think twice, Goodman says. "It's penny wise and pound foolish to cut back recess and put in academic time. Because, in the end, the kids won't be prepared for academic time. "It's totally important for me to educate the whole child, and the body is part of the whole child," Goodman adds. "And that's what Playworks does: teaches you to work as a team and not always be concerned with winning." Goodman says the Playworks program and coach have also helped to reduce playground conflicts through old-school games. When disputes break out, Wong and teachers promote rock, paper scissors to resolve them. Jackie Hemann, Playwork's East San Francisco Bay program director, says the coaches "create a physically and emotionally safe environment for kids to just be kids. That means trying new things. If they fail, it's OK. It's a setting where they're not going to be made fun of for trying new things, and there will be a lot of praise when they do succeed." While some schools are shortening recess time, Playworks and other groups also report that kids in areas of concentrated poverty and low-income neighborhoods are far more likely to see cuts in recess time than schools in wealthier districts and are also more likely to have no recess at all. About 70 percent of Ruby Bridge's 600 students qualify for free or reduced lunch. Some come from Alameda Point, one of the five poorest neighborhoods in the Bay Area. Barry Savin, who teaches fourth and fifth grade here, says some of the kids don't have a safe and secure place to play outside back in their neighborhoods. And some parents might not emphasize outdoor play time after school, he adds. The Playworks program, he says, has been a huge boost. "It allows them to have a structured place in which they can go play games and have fun. A lot of the stress is on teamwork and cooperation, and hopefully those things will carry on." 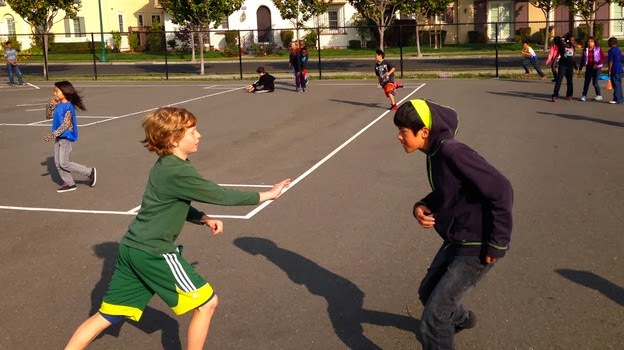 Savin and other teachers work with the Playworks coach to encourage every child, including kids with physical challenges, to take part in some kind of semi-structured game at recess. Wong has also trained some three dozen kids across the school to serve as "junior coaches," who help organize games, resolve conflicts and clean up. And while one third-grader says he enjoys junior coaching because he gets to leave class two minutes early, another says it lets the kids "have a little bit of fun after finishing our work. And we have to finish our work so we can do junior coach duty." The school helps pay for part of the program, which costs about $30,000 per year, with federal school money targeting low-income areas. Even those who support Playworks lament the fact that the program has to exist at all. It's a sad testament, one teacher says, to how some schools and neighborhoods have de-emphasized play and recess, just as kids ramp up screen time on tablets and smartphones.